This is the “5 lake star task” in the local area for the aspiring pilot starting to branch out. 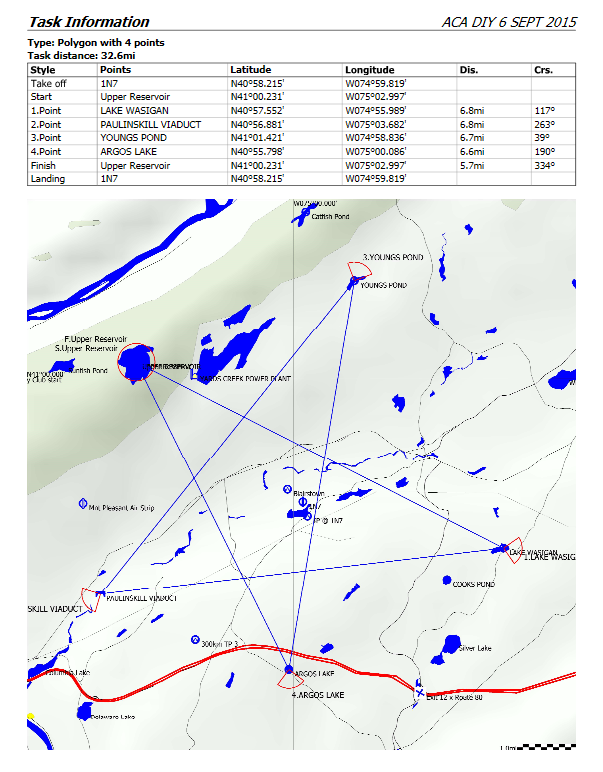 This 50km task is great to be flown in one of our 1-26 gliders close to the airport and is good practice for the 50km straight out silver distance flight. Aero Club Albatross (ACA) has been challenged by Valley Soaring Club (VSC) to compete with them in a “Boomerang” X-country soaring contest. ACA has accepted their challenge and promised not to beat them too badly. Valley Soaring is located at Randall Airport just outside Middletown, New York. It is about 44 SM North East of Blairstown, as the glider flies. And parallel to Route 84. So don’t land on the highway. The trophy is the Boomerang, pictured above. To claim the trophy a pilot must fly from his/her home airport to the other airport, where the trophy is, and land. The trophy is now taken home with the pilot who claimed it. You will be given a FREE 3000′ agl tow to send you on your way if you want to try and fly home again. Or you can call for a ground retrieve to get home. A scoring scheme has been set up to keep track of the Boomerang and to declare a winning club at the end of the season. ACA will also create a plaque, which will be to be kept in the Jersey Ridge Soaring office at the Blairstown Airport, so that the names of the pilots who claim the boomerang will be recorded in the annals of ACA history. This is a relatively easy (Silver Badge) flight and is meant to help build the confidence of new X-country pilots. However any pilot in any type glider may compete. There are 2 airports, a ridge, and countless fields between Blairstown and Middletown. New pilots should talk with instructors and seasoned X-country pilots to learn how plot the course and determine final glides. On any given day that you can get to 5000′ feet you can do this flight. 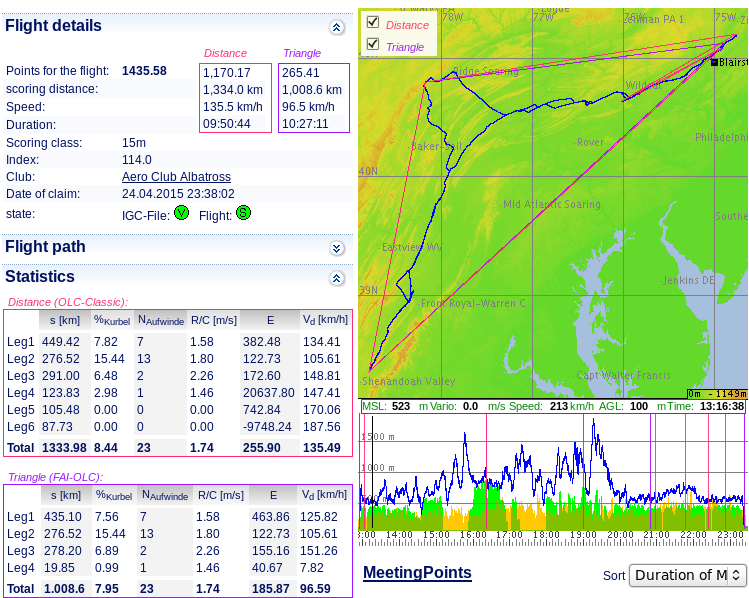 The Governor’s Cup is a popular all season long soaring contest between gliding clubs in the NJ-NY-PA (Region 2). The concept for the Governor’s Cup was put forth by Bobby Templin(1K) of Aero Club Albatross. Bob realized that it would be fun to compete against others from eastern Region II without the need to organize formal contests every weekend. He also realized that it can get dull racing against the same two or three people from the local club. Instead, he figured pilots should be able to launch from their regular homefield and compete on a level playing field with others from the area. Pilots may fly the course in any direction launching from any of the above sites, or any other airport in the area. They are scored on their three best flights of the Contest Season. Flights may be flown any day within the Contest Season, in any glider. Please click here for turnpoints, registration and more info.